Amazon will allow you to list multiple items together for some categories. This is still classed as a single listing with a single price, but the name and description includes multiple items. The availability displayed on the listing is for the items when purchased together and not individually. It is not possible to sell the items individually, unless separate and unrelated listings are created; these will have their own price and availability. 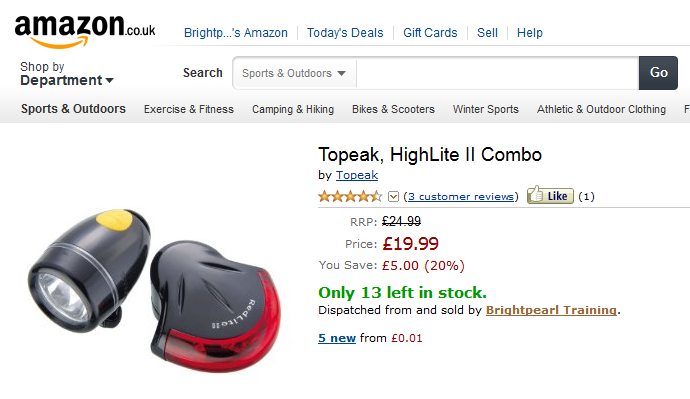 In this example, both bike lights can be purchased for £19.99. These types of “bundled” listings will download into Brightpearl as a single item (it has one ASIN) that can either be connected to a Brightpearl product (which describes multiple items) or it can be connect to a Brightpearl bundle. A Brightpearl bundle is created by grouping the individual products. This allows each individual product to have its own record, price, name and inventory level, but to be sold as part of a pack, or kit which has a single price. Shipment update Yes Marked as shipped as soon as one component is shipped in Brightpearl. Brightpearl bundles need to be created and managed within Brightpearl, and cannot be created from a listing. A listing can be connected to a bundle in Brightpearl. We will update the availability for your listing in Amazon based on the on-hand levels for each individual bundle component. This means that the minimum availability in Amazon is taken from the lowest on-hand level for those items within your bundle. For example, if your bundle consists of one pair of shorts and two different belts; then you would need to have a minimum on-hand figure of 1 for your pair of shorts, and 1 each for your belts in order for your listing to be available to buy on Amazon. If any of your individual components do not have enough on-hand stock to complete one bundle, then your listing will not be shown as available to buy on Amazon. The price is managed by Brightpearl and is taken from the connected bundle. Where a listing is connect to a Brightpearl bundle, all the items within the bundle are added to the sales order and the inventory is allocated to reserve it for the order. This in turn updates the on hand inventory levels and updates all sales channels with the new available quantity. Shipping of bundled items will update the order in Amazon. It is possible that an Amazon order is split into multiple shipments in Brightpearl. If items within the same bundle are sent in different shipments the whole bundle on Amazon will be marked as shipped when the first item is shipped in Brightpearl.